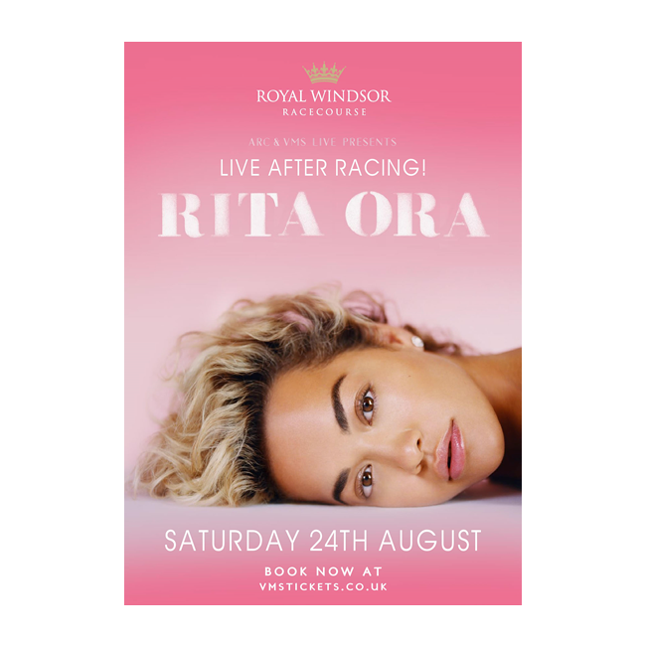 We are thrilled to announce that global icon Rita Ora plays Royal Windsor Racecourse on Saturday 24th August 2019! It’s been a momentous few years for Rita Ora. Since her rise to prominence in 2012 she’s sold a staggering seven million singles, had 13 top ten hits and recorded a number one platinum-selling debut album with Ora. Number-one singles Hot Right Now and How We Do (Party) established her as a household name and kept her atop the UK charts. Her arrival was so impactful that she became the artist with the most number-one singles on the UK singles chart that year, with three consecutive releases reaching the top position. It has been an exciting time for Rita, with the success of her platinum-selling album Phoenix released last year, breaking music records. The first single from the album ‘Let You Love Me’, became her thirteenth top 10 single, setting a new UK chart record for the most top 10 singles by a British Female Artist. Her popularity continues to grow, with seven million single sales altogether, as well as billion spotify streams worldwide from her latest five singles alone. She has also been recognised within the industry, with 5 BRIT award nominations under her belt, as well as countless collaborations with some of music's hottest acts, including Liam Payne, Charli XCX and the late Avicii. The singer’s release, ‘Let You Love Me’, became her 13th Top 10, meaning Rita set a new UK chart record for the most Top 10 singles by a British female artist. The star overtook music icons Shirley Bassey and Petula Clark, who each lay claim to 12 Top 10 hits. Let You Love Me also featured in the official top 40 most streamed video tracks of 2018 chart while four of Rita’s singles also featured in the ‘Biggest 2018 Airplay Records’ chart. Rita has already cemented herself as one of the UK’s most successful pop acts of the decade and shows no signs of slowing down in 2019. Currently on a world tour, which will continue until May, Rita will play her first ever UK arena shows in prestigious venues such as London’s The O2, and Glasgow’s SSE Hydro. The tour also marks her first solo dates in Asia and Australia. Rita Ora promises a superb night of entertainment performing all the hits. Don’t miss your chance to see Rita perform live after racing on Saturday 24th August. Tickets will be on general sale from Friday 5th April.